This site allows you to develop a home construction or replacement cost that considers all the important variables: materials used, design features, quality, size, shape, heating, cooling and geographic area. Your printed estimate shows detailed labor and material costs for each of 34 construction cost categories. Plus, it's FREE! Great site to get quick sales history on properties and more. Multi search features. Type in an address to determine if your property is a historical landmark. CityNews combines a database driven interface with an online interactive mapping component. There are two main sections: the Parcel Search & Tabular Data Section, and the Interactive Mapping Component. This site provides historical building permit information for the last 18 months. Site is updated daily. This is another awesome site for doing a mini-title search on a property. You can search by Grantor, Grantee, PIN number, etc. I prefer PIN number if you have it. If you don't, you can get it from the Cook County Assessor's site. It will give you a history of every recording made against a property since 1985. To check for prior sales, select any document type that has the word DEED in it; EX: Warranty Deed, Trust Deed, etc. The site will tell you the document number, date of sale, date of recording, grantor, grantee and sales price. The site allows you to select any document referenced and dump it into a document container (fancy name for shopping cart). You can then pay a fee to have the actual document mailed to you. Want to know how much a properties taxes are? Is your owner current with their taxes? This site will tell you. The calculator projects what a given house purchased at a point in time would be worth today if it appreciated at the average appreciation rate of all homes in the area. Make sure your condo is in a HUD approved complex before your borrower goes FHA. This site provides approved Condo numbers from HUD. When site opens, click on External Web mapping application. Search by PIN. Site provides lot size, prior sales price and date, partial legal description, township, zip code, owner of public record. Click on Cadastral Map box to get lot size on a plat map. Search assessor property records by address. Site provides lot size, GLA, PIN #, owners name, age and assessor's market value. Great site for searching and tracking Bank REO's, foreclosures and preforeclosures. vPike.com provides Google street views, area photos, local traffic conditions, area webcams, local news and driving directions. Site shows zip code boundaries. One of the leading appraisal companies in the Midwest based in Chicago. Association for State Regulatory Officials from around the country. State of Illinois licensing division. Cool site that offers market stats for neighborhoods in Chicago. You can search by seasonal comparisons and by bedroom/bath count. Stats and graphs. AcreValue is a free site used by farmers, landowners, investors, bankers, brokers, and industry professionals to analyze the value and productive capacity of farmland. Great site that offers real time real estate market research. Some research is free. Click on Chicago under the CHOOSE YOUR LOCAL MARKET section and select a town. Provides median home price trends, market activity index, average cost per square foot and average days on market for residential properties. Site provides characteristics and amenities of hundreds of properties. Profiles include condominiums and co-ops in various areas of Chicago and the North Shore. Includes year built, conversion date, # of stories, # of units and more. This site allows you to develop a home construction or replacement cost that considers all the important variables: materials used, design features, quality, size, shape, heating, cooling and geographic area. Your printed estimate shows detailed labor and material costs for each of 34 construction cost categories. Plus, it s FREE! Great site for property info. Search by address, town, buyer, seller, etc. Tons of data including FSBO info. You can buy floorplans, docs, amendments...et al for Chicago condos with 50+ units. Data for over 600 building. A bit pricey for monthly access. Type in an address to determine if your property is designated as a historical landmark. Site reports sales transactions from recorder office data. Several counties are online. This site lets you type in a property address and it provides you with a history of building permits and building violations. Another site offering free statistical data on Cities and Towns across the country. Condo Shark is a free, easy to use tool that tracks financially distressed properties where the listing price has been dramatically reduced. CondoCerts is an Internet utility developed to simplify the process of delivering and obtaining Homeowners Association data and documentation for a variety of users in any association real estate transaction. Appraisers can register for free. This site has numerous Construction Calculators which will help you estimate the amount of material that you will need for your construction jobs. This site offers free web access to Public Records all over the country. Some of the site links include: Assessors, Recorders, Treasurers, Law Enforcement, Courts Records, etc. You can spend hours on this site folks. Site tracks foreclosure stats by state. 5 month look back, including current month and 1 month projected stats provided. Deadmalls.com has the histories of various malls that have closed, some that have been revived, etc. Another good site to search for community info on cities and towns around the country, plus it is a cool name for a site! Great site for historical data, maps and other reference tools for Chicago. This site allows you to estimate a lot size from an aerial overhead view. Great site for tracking foreclosure rates by state and county. Provides a six month history. Site sponsored by Illinois Dept. of Transportation. Great data on traffic counts, road construction, etc. This site has a list arborists in Illinois. They are listed by County and services. Arborists with a code of G" perform appraisals. You can also scroll down to the bottom of the website and get phone numbers for the companies that offer appraisals. On-line searchable economic development database that provides detailed information on buildings, sites and locations for businesses looking to expand. Over 6,500 communities and over 15,000 available properties throughout a 12-state area are represented. Great website for measuring sites and structures from aerial photos with strong zoom in capabilities. Is your property a manufactered home or a modular home? This site is sponsored by the Institute for Building Technology and Safety (IBTS), and it provides samples of state labels, label size, material, colors, description of its application, and miscellaneous comments along with the state program contact information. If you wish to view a particular state s label and contact information, click on the state in the list. Municode.com is a site that offers a FREE library of over 1100 codes of ordinances for local governments from around the country. NAR releases statistics on state-by-state existing-home sales and metropolitan area median home prices each quarter. The state existing-home sales report includes single-family houses, condos and co-ops. The price report reflects sales prices of existing single-family homes by metropolitan statistical area (MSA). Beginning on February 15, 2005, this quarterly report includes a breakdown of condo and co-op prices by metro market. Site shows the location of pipelines in every state. National Relocation helps you research and compare neighborhoods and cities across the United States. You can view city data information, crime rates, demographics like population, educational attainment, employment information, income statisticts, colleges, parks, churches, and much more! This site offers a ton of public data all over the country. It appears to be mostly fee based. Some of the stuff you can search for includes: Properties Search, Criminal Records, Divorce Info, Death Info, Comparable Properties, Transfer Reports, Prior Sales, Parcel Maps and more. One of the cool free features let you search Towns/Cities/ Zip Codes to see what County they are in. This Website allows online viewing of soil survey maps and reports throughout the country. This new application greatly enhances access to information on soils. Site provides local ordinances, tax maps, file maps and flood maps. Site loads slow. Has a list of Assessor s, Treasurer s and Recorder s offices with online data from around the country. Enter the State, County and Property value to generate a estimated property tax. Site offers property transfer searches for 15 Illinois Counties including Cook, DuPage, Will, Peoria, and Lake. AVM site. Also provides comp map, GLA, year built and lot size for subject and comps. Provides prior sale on subject property. Great site for searching and tracking Bank REO s, foreclosures and pre-foreclosures. The Cost vs. Value Report establishes cost-to-construct benchmarks for a set of common remodeling projects, then estimates how much of that investment will be recouped at resale in the current market. Allows you to cross reference either a phone number, property address or homeowners name. Another online ordinance site. Page allows you to select a state and then it lists towns with their codes online. May be limited to those using the sterling format. Site offers tons of info on properties including assessor info, property info, rental data and local listing info. Great site for tracking down phone numbers! Site finds personal info including phone numbers, addresses and more. Free valuations online. Use it as a secondary source for comp data. Search for sales in a market area. Type in address, town, state and zip code. Hosted by the Federal Financial Institutions Examination Council. Website profiles general demographic characteristics of all Illinois Communities, Counties and townships. Provides a wealth of social, demographic and economic information. Site for listings of all participating communities in the National Flood Insurance Program. FEMA flood maps online - FREE! Great site for identifying Chicago neighborhood boundaries. Site offers Plat Maps, aerial maps, building footprint maps and neighborhood maps. This site shows you the exterior footprint for buildings in the city. Search by property address. Great site for GIS data in Cook County. Use the Cook Viewer. Provides various online maps for environmental information. One of the best mapping programs out there. Just enter the street address, town, state and zip. Check out the street view feature! Great site for finding information on wells throughout the state. Free mapping program. Search by address. Provides online soil surveys and maps for many States and has several links to additional offline data. Local ordinances, tax maps, file maps and flood maps. Site has every USGS topographic map, orthophotomap and aerial photograph in the entire United State. Provides Google street views, driving directions, local traffic conditions, maps, and local area photos from Panoramio and Picasa. Just type in street, address and state. Online lookup for local and state criminal activity offering both personal and corporate records. This site has free Excel spreadsheets for a variety of financial calculations and cash flow models. Financial Glossary with over 6000 real estate definitions and 20,000 related terms online. Great site if someone tries to stump you with a big fancy word/term. Over 17,000 FREE searchable public records databases. This could be the best appraisal tool site out there yet. Site allows you to search for thousands of WiFi Hot Spots around the world. Over 300 sites in Chicago alone. Great site all of appraisers who work in Chicago should use for their zoning. Simply type in the address and a map pops up with the zoning and location of that property. You can then view either a street view, an address view or an aerial view. Plus is has an easy to read zoning code list. This is a complete zoning map of Barrington Hills. It is in PDF format so you will need to have Adobe Reader installed to view it and you will need to use the zoom tool. Nice color coded PDF of Batavia s zoning map. This site has numerous PDF documents including a zoning map. A very nice color coded PDF of Cary s zoning map. Free zoning maps for the entire city. High quality map. Takes a while to load. Site offers Zoning Ordinances, Zoning Maps, Building Permits and more. Very detailed color coded zoning map for Des Plaines. When the link opens up, you will have to scroll down to the Zoning map links on the lower left hand side of the page. You will probably need the zoom tool. A detailed color coded zoning map of Elmhurst. Color coded PDF. Takes a while to load. A nice color coded PDF of Glenview s zoning map. Nice searchable database with maps. Click on INTERACTIVE CITY MAPS in the left hand toolbar. You may need to read the instructions. 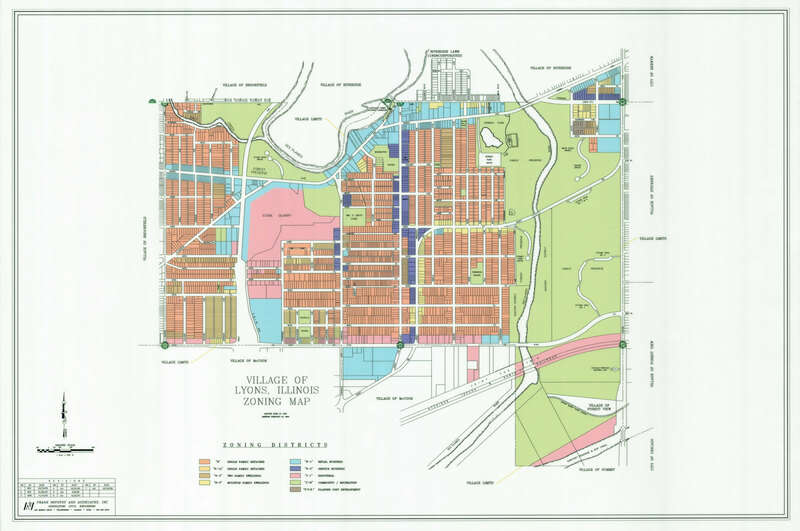 Nice color coded PDF of Highland Park s zonging map. This site is a pdf you can view that provides info on subdivisions in Joliet including zoning, school district, developers name, # of units, etc. Big Map. Takes a while to load. A color coded PDF of LaGrange Park s zoning map. Maps for all the Townships. A nice color coded PDF of Lake Forest s zoning map. Click on Zoning. Choose the correct township the parcel is located in and it will then display that particular map. A nice color coded PDF of Lisle s zoning map. Online zoning info for Mt. Zion. Color coded maps show actual plat plan. A nice color coded PDF of Northbrook s zoning map...loads very slowly. A color coded PDF of Park Ridge s zoning map. Zoning maps for Rockford. Scroll down on this page to view map panels. Refer to the map key panel to help you determine which zoning panel your property is in. Scanned zoning map in B & W, in PDF format. A nice color coded PDF of St. Charles s zoning map. Select Zoning Map from the list of links. Click on the center GIS web button, a pop up screen shows all of Will County. You can click to zoom in, or use the tools at the top. As you zoom in, parcel numbers show up. When you use the identify function, you get zoning and can access the Will County assessor on the popup. Wilmette s zoning map split up into districts. Click on Community Development, then select Zoning Map. FHFA was formed by a legislative merger of the Office of Federal Housing Enterprise Oversight (OFHEO), the Federal Housing Finance Board (FHFB) and the U.S. Department of Housing and Urban Development (HUD) government-sponsored enterprise (GSE) mission team. FHFA regulates Fannie Mae, Freddie Mac and the 12 Federal Home Loan Banks. Estimates a broad range of economic variables such as income, gross domestic product, retail sales and residential construction. Offers a variety of national surveys to gather data on employment, unemployment, productivity, prices and earnings. Site provides direct access to databases of the DOL and of other government agencies that contain labor, employment, and economic data. This Handbook is updated regularly and it contains all appraisal related FHA topics. Use the Control F feature to search for a specific keyword. This PDF provides a line by line description of all FHA's appraisal reports. This is the HUD office that oversees appraisal requirements for the Chicagoland market. Huds client information and policy system. HUd has created this site to track and locate all REO properties for FHA/FANNIE/FREDDIE. Provides property data search by name, PIN# or property address. Provides property data search by name, PIN# or property address...Plus a whole lot more stuff. Great site. This site has pictures of every residential property in Cook County. This sites search feature enables you to locate any documents on record with the Cook County Recorder of Deeds. Once you locate the desired document(s), you can purchase copies of the documents. Among other things, this site offers a property tax and assessment search feature. View and query various maps and County data. Property Searches for properties in Grundy County. Search assessor property records by PIN#, property address, or owners name. Site provides info on property tax bills. Also has an icon on the tax page that provides an aerial photo with plat overlay. Unfortunately, no site measurements are provided. Search by address and PIN # for tax info and sales information. Free Plat maps and more. Search by address, PIN, Street etc. Click on the TASKS button to enter info. You may want to check the Lots, Text and Photography boxes in the LAYERS section. Search County treasurer and assessor property records by PIN# or owners name. Quarterly fee of $150.00 for access to full index of all recorded documents and images dating back to 1980. Search assessor property records by address. Offers links to all county departments including County Treasurer and Assessor. Lots of online tools and resources. Great site for property data and prior sales information. Site will not work if you have a Pop-Up blocker on. You need to click and zoom a bunch to find your parcel, but once you do you can click the upper tool bar for property card. Then click on the parcel number on the map and this allows you to view the property card in it s entirety. Search PIN number or property address. Search treasurer property tax records by PIN#, property address, or owners name. Contact info for County departments. Real estate assessment search page. You can search by name, address, or PIN#. Free plat maps. This site provides lot sizes, aerial views, has a measuring tool, partial legals and a ton more. The first time you go on this site you will need to click on the ADD MORE INFORMTION tab and check a few boxes. I use Aerial View 2008, Parcel Text, Lot Text, Dimensions, Road Names, Parcels and Boundaries. You can search by PIN, Address, Subdivision, etc. Provides property data search by PIN# or property address. You can search by name, address, PIN# and more. Provides property and tax data. You must enter the word guest as both the user name and password to access the data. Search for public land records in St. Clair County. You must register as a user on this site. Select the professional user. It costs .35 cents a record. Great site for finding public verification of new contruction. This site doesn t give a lot of data, but it verifies the address and owners name. It also shows you assessed value info and prior sales. Some of the properties have a legal description. You can only search by PIN # or address. You can enter the PIN number and get the tax bill amount. It also tells you acreage, but not lot sizes smaller than an acre. This site could be helpful verifying taxes, property address, owners name and Township information. You can search by name, address or PIN. Info includes unmeasured lot lines, tax info, prior sales info and aerials for most (but not all) of Winnebago County; links to treasurer and township assessor sites. General information page with many County phone numbers. National index to Assessor sites from around the country. This is a great site. Search Assessor records by address and PIN #. Search by PIN# or property address. Site has all residential photos, sketches and property information and sales assessments history. On the Home Page scroll down and click on the first button that says CLICK HERE, you will then go to a pdf showing most of the properties in Homer sorted by PIN number. If your property is not listed go back to the home page and click on the second CLICK HERE button to fill out a request form to get your property info. Search by property address or PIN #. You can search by address or PIN #. Best to search the filed titled Appraiser Data by street name. Search by PIN#. There is even a special section for appraisers with some great property data like building style, square footage, year built and prior sales info. Great job Plainfield! This is the USDA s Rural Development site for Illinois. Site offers tons of resources including appraisal reporting standards under the Lenders icon. IHDA offers first-time homebuyers below market interest rate loans based on purchase price and income limits. Under ADDITIONAL RESOURCES click on the LEGISLATIVE LOOKUP link to access the search page. Site allows searches to find Condo HOA's and other LLC's registered in Illinois. Laos may provide contact info. This site takes a minute to load. It is an alphabetical phone list of every State employee, including Representatives and Senators. Site for current interest rates for local bank products including mortgages and CD s.
A comprehensive resource of real estate investment and development news, trends, analytics, and market research. This is an online news service featuring many articles about the appraisal industry. News and analysis for the real estate appraisal industry. Organization of property tax Assessors.